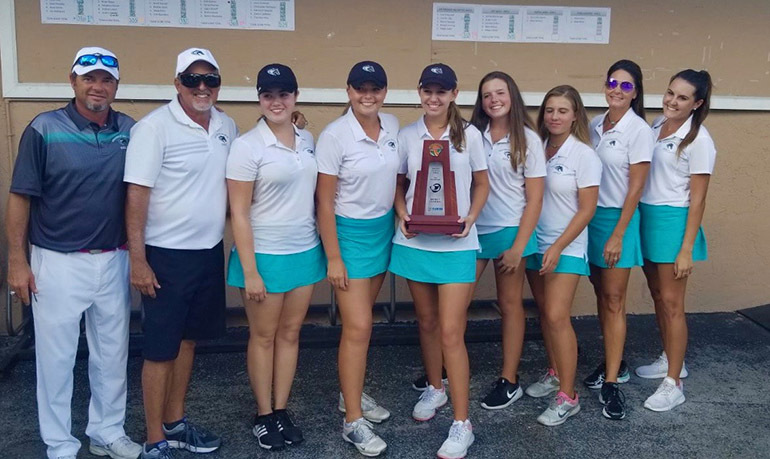 Archbishop McCarthy High School's girls golf team, who took second place statewide in Class 2A, pose with their coaches after their win at the district level. From left: Coach Carl Phillips, Coach Henry Portela, Erin O’Donnell, Natalia Jimenez, Jennifer Lilly, Rileigh Baker, Morgan Herring, Coach Jean Carver, and Coach Lauren Carver. 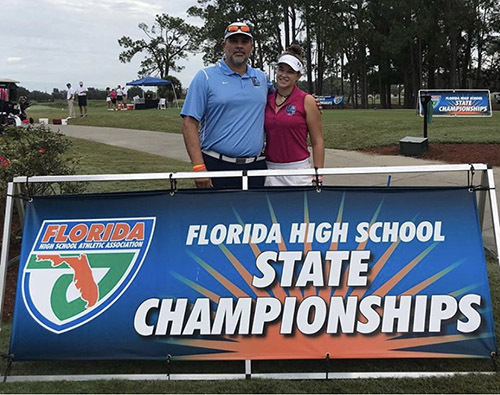 EDITOR’S NOTE: This round-up is compiled from the Florida High School Athletic Association results. Click here for separate stories on St. Thomas Aquinas volleyball and Belen Jesuit cross country, which both won state titles; as well as a separate roundup on the state football finals, which featured Christopher Columbus, St. Thomas Aquinas, Cardinal Gibbons and Chaminade-Madonna. 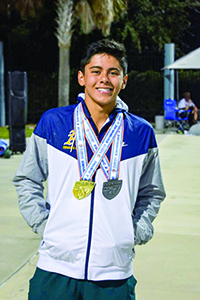 MIAMI | St. Thomas Aquinas golfer Brett Roberts, Aquinas swimmer Juan Zapata and Belen Jesuit swimmer Andrew Wong each took the final step to victory in their respective state championships in November. Roberts won the Class 3A individual boys golf title. Zapata won the 100-yard butterfly. Wong conquered the 200-freestyle. St. Thomas Aquinas High swimmer Juan Zapata became state champion in the boys 100-yard butterfly. He excelled in the classroom as well, carrying a 4.7 grade-point average and scoring a 1350 on his SAT, in addition to making nine practices a week. 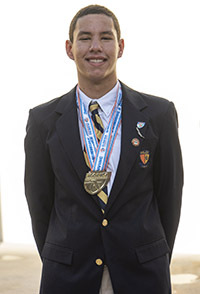 Belen Jesuit's Andres Wong won the Class 3A state swimming championship in the 200-yard freestyle. Senior Zapata and sophomore Lance Lesage each took top-five finishes to help St. Thomas Aquinas finish 13th overall in the team race at the Class 4A boys swimming state meet. The Raiders finished with 63 points, trailing the 231.6 of champion Oviedo. Zapata won the boys 100-yard butterfly in 50.06 seconds and finished fourth in the boys 200-yard individual medley in 1:53.37. Lesage took fifth in the 100-backstroke in 51.55. Aquinas swim coach Martin Grady said that Zapata excelled in the classroom as well, carrying a 4.7 grade-point average and scoring a 1350 on his SAT, in addition to making nine practices a week. Aquinas’ girls took 17th with 30 points in the Class 4A girls. The Raiders’ best finish was 10th in the 400-freestyle relay. Belen’s Wong had a pair of top-three finishes to help the Wolverines finish 12th in the Class 3A boys team race. Belen had 54 points, while Venice won the overall meet with 230 points. Wong won the 200-yard freestyle in the Class 3A boys state final. He led at each turn, finishing with 1:39.02, one second ahead of Venice teammates Arik Katz and Rene Strezenicky. Wong said he had been working a lot on turns and getting a good push off the walls out of the turns. That work paid off on those finishes. He also credited his experience in the state meet. He had finished fourth in the 200 as a sophomore last year and 19th as a freshman. He said that during the 200-freestyle, he slipped at the 75-yard turn and didn’t get a good push-off, but his work on the second half of the race helped him to overcome the slip. Wong is now entering winter training, in which he swims more laps than in the regular season. He said it helps him to build a base before he tapers off the training for big meets. He also hopes a more refined weight regimen will help him shave more time. That would help him accomplish one of his goals — to swim in college. To date, North Carolina State, Harvard, Penn State and Nevada-Las Vegas have inquired. “I really want to swim for a good school,” Wong said. Immaculata-La Salle senior Gabriella Antonini finished 13th overall in the Class 1A girls 100-backstroke in 59.45. St. Thomas Aquinas High's Brett Roberts won the Class 3A boys individual championship with a 9-under 135. Our Lady of Lourdes senior Daniela Spillert, pictured here with her coach, Ignacio Vazquez, nearly made it an archdiocesan sweep of the 3A individual titles. Competing as an individual, Spillert took second with a 4-under 140 in the state championship. Roberts won the Class 3A boys individual championship with a 9-under 135 on Nov. 6-7 over the El Campeon Course in Howey-in-the-Hills. The junior followed a 3-under 69 with a 6-under 66. Roberts, who tied for second last year, had 12 birdies for the tournament. He beat Bartram Trail’s Brett Schell by 1 shot. 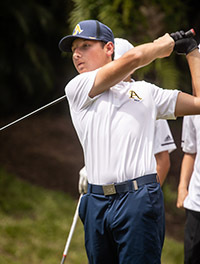 In the team race, St. Thomas Aquinas finished fourth with a two-day 609, trailing champion Winter Park by six shots. Our Lady of Lourdes senior Daniela Spillert nearly made it an archdiocesan sweep of the 3A individual titles. Competing as an individual, Spillert took second with a 4-under 140. She rebounded from a 72 to shoot a 4-under 68 on Wednesday, tallying seven birdies for the tournament. Lake Mary’s Karoline Tuttle won with back-to-back 69s. Archbishop McCarthy’s girls took second in the Class 2A team race, shooting a two-day 660. Plantation American Heritage won with 597, getting three players in the top eight. Archbishop McCarthy junior Jennifer Lilly took ninth with a 9-over 153. In 2A boys, Archbishop McCarthy finished seventh with a two-day 669. The Mavericks were led by Justin Lilly, who tied for 17th in the individual race with a 12-over 156. Archbishop McCarthy High School senior Tommy Rodriguez came in 17th in the Class 2A state championship race. 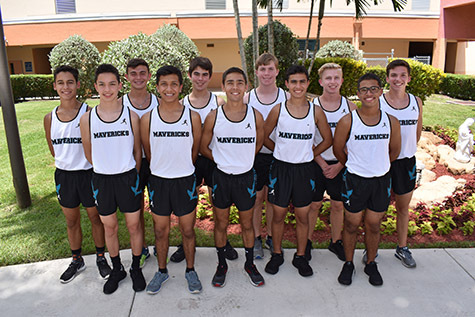 Archbishop McCarthy High School's boys cross country team includes, in alphabetical order: Josiah Acevedo, Adrian De La Rosa, Blake Engelmann, Justin Falon, Roberto Huayamave, Daniel Jardon, William Lyons, Calvin May, Nichola Mestre, Thomas Rodriguez, Benjamin Smith, and Nikolas Torres. St. Thomas Aquinas’ boys finished fifth overall in the Class 4A boys meet with 193 points. Junior Aidan Breslin led the Raiders with a ninth-best 16:13.46. Christopher Columbus finished eighth with 230. Sophomore Malcolm Brown finished 26th overall in 16:37.78 to lead the Explorers. Sarasota won the meet with 84 points. Our Lady of Lourdes Academy finished ninth in the Class 4A girls with 256 points. Junior Isabella Timiraos led the Bobcats with a 33rd-best 19:41.91 time. St. Thomas Aquinas was 15th with 337 points, led by senior Kerrigan McGreevy’s 35th-best 19:42.33. 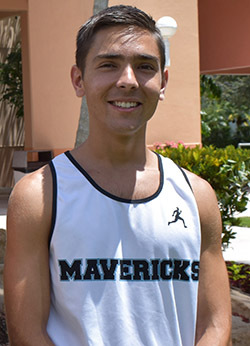 In the Class 2A boys race, senior Thomas Rodriguez represented Archbishop McCarthy as an individual runner. Rodriguez took 17th in 16:23.51. In the Class 2A girls race, St. Brendan finished 11th with 334 points. Bolles won that race with 66 points. Junior Noemi Kerjean led St. Brendan with a 59th-best 20:31.07. Cardinal Gibbons' Jenna Giaquinto prepares to serve during a game. She finished her senior season with 244 kills and 249 digs. St. Brendan High captain Emily Diaz, a junior, goes for the kill during a game. 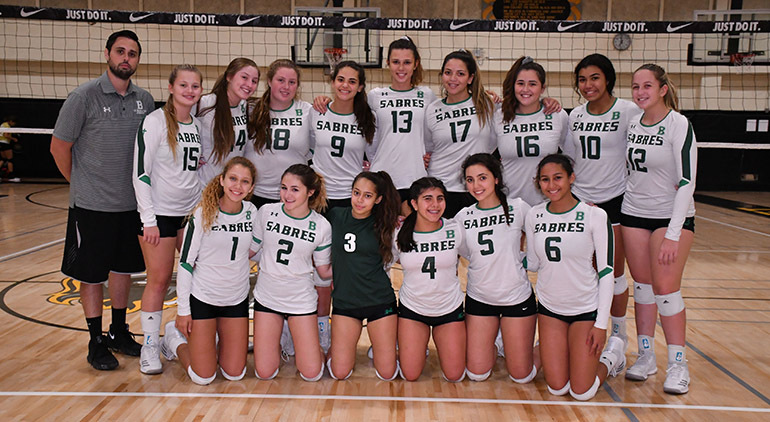 The Sabres volleyball team advanced to the Region 4-7A final for the third consecutive season before losing 30-28, 26-24, 25-20 to state finalist Stuart South Fork. Fort Lauderdale Cardinal Gibbons almost joined St. Thomas Aquinas at the state finals in Fort Myers. 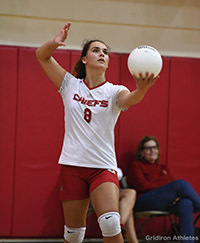 The Chiefs lost to Sarasota Cardinal Mooney 25-23, 25-27, 25-22, 25-23 in a Class 5A state semifinal. The Chiefs, who own the state record with 20 state titles, had missed the playoffs in 2016 and 2017 after winning the 2015 Class 4A championship. Jenna Giaquinto finished her senior season with 244 kills and 249 digs, while junior Jeyhlen Thomas tallied 92 blocks and senior Isabelle Victor posted 65 blocks. Senior setter Caitlyn Faber tallied 761 assists. Senior Aubrey Worley led the Chiefs’ back-row defense with 273 digs. St. Brendan advanced to the Region 4-7A final for the third consecutive season before losing 30-28, 26-24, 25-20 to state finalist Stuart South Fork. St. Brendan beat Miami Northwestern and Doral Academy to reach the region final. Junior Emily Diaz finished the season with 214 kills, while teammate Juliana Lentz had 211 kills and a team-high 77 blocks. Archbishop McCarthy also advanced to the region finals. The Mavericks lost to Merritt Island 25-19, 20-25, 25-20, 25-20 in the Region 4-6A final. Archbishop McCarthy beat Lincoln Park and Suncoast to reach the region final. Msgr. Edward Pace made the playoffs, earning the fourth seed in Region 4-4A, but the Spartans lost to Gulliver Prep 27-14 in the first round. St. Brendan finished its first-ever season with a 3-5 record. The Sabres, playing an independent schedule, beat Miami Pinecrest Prep twice, 28-0 in the season opener and 28-8 in St. Brendan’s homecoming game. The Sabres also nabbed a 24-6 victory over Miami Florida Christian. 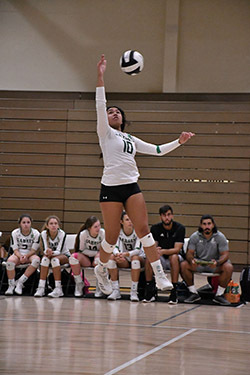 St. Brendan High's girls volleyball team advanced to the Region 4-7A final for the third consecutive season before losing 30-28, 26-24, 25-20 to state finalist Stuart South Fork.